You are currently browsing the The Accidental Hawaiian Crooner blog archives for May, 2013. Did you guys catch the webcast of the 2013 Nā Hōkū Hanohano Awards the other night? Wow! It’s amazing to be able to sit in an apartment 5,000 miles away from the ceremony and still be able to tune in. It’s no secret that I love Hawaiian music. I value it as an art form. I believe in its ability to heal a person from the inside out. I love and respect the artists working so hard perpetuate this incredible musical tradition. And when all of the year’s greatest Hawaiian artists come together for an award show, it’s unbelievably cool. Every year, Hawai’i has its big Hawaiian music awards show, the Nā Hōkū Hanohano Awards. Produced by the Hawaiʻi Academy of Recording Arts, this beautiful event honors the best in Hawaiian music. The cream of the crop. The voting members of HARA certainly had their work cut out for them this year. With all of the jaw-dropping talent that was nominated for awards, I don’t know that I would have been able to choose a winner in every category! I mean, the talent is STELLAR! And then… they have other categories like Haku Mele of the Year which celebrates a composition written in Hawaiian. And Hawaiian Language Performance. And Hawaiian Album of the Year. I was going to post a list of the winners, but the I realized that our friends at MELE.com have already done an amazing list–including links to the albums/artists that won! It’s fantastic. Truly. And you can check it out by clicking HERE. Please continue to support Hawaiian Music and Hawaiian Artists. 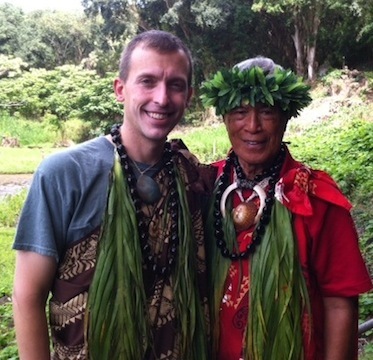 We are all working to share some Aloha with the world. These little delights are called Surinam Cherries. (That’s Eugenia uniflora, for those of you who prefer the scientific name!) They seem to grow all over the place in Hālawa Valley on Molokai–along the trail to the waterfalls as well on trees in front of the house. But these are good. And plentiful. My Hawaiian mom makes delicious surinam cherry “butter” from them. And one magical evening after a long day’s work in the loʻi, we had a special dessert. We put the the surinam cherry butter over vanilla ice cream. Kind of like a sundae topping. Now, I don’t usually eat ice cream here on the mainland, but in Hawaiʻi, I’ve learned to eat whatever is offered to me. And I’m so glad I ate that bowl of ice cream–it was DELICIOUS! Bitter and sweet all at once. 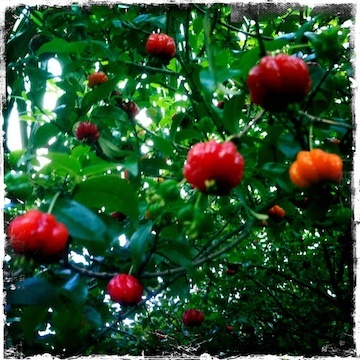 Have YOU ever eaten a surinam cherry?